Illustration by Graham A. Judd for Flora of Middle-Earth: Plants of J.R.R. Tolkien’s Legendarium. Reprinted by permission of Oxford University Press. Flora of Middle-Earth: Plants of J.R.R. Tolkien’s Legendarium will be released by Oxford University Press on August 15, 2017. It’s impossible to imagine Middle-earth without picturing hobbits smoking pipe tobacco or dwarves drinking beer. J.R.R. 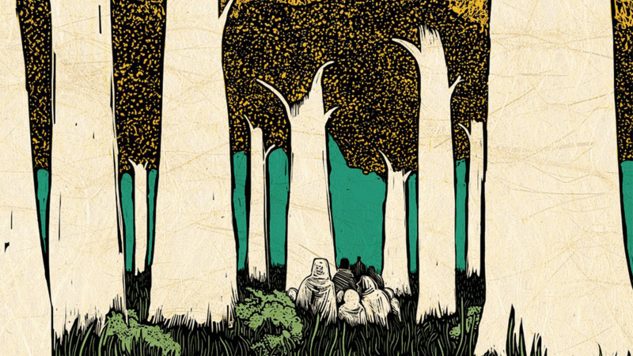 Tolkien’s beautiful, haunting world is populated by a host of races—and even more species of plants. Tolkien describes over 160 types of plants in his works, many of which are either real or are based on existing species. And thanks to botanist Walter S. Judd, now you can read about them all. Flora of Middle-Earth: Plants of J.R.R. Tolkien’s Legendarium includes detailed entries on every plant in Tolkien’s universe, from coffee beans to barley and everything in between. The book also boasts hand-drawn illustrations by artist Graham A. Judd that bring the plants to life (you can check out his art in the gallery). We’re excited to share an exclusive excerpt, courtesy of Oxford University Press, ahead of the book’s release on August 15th. For all of you Tolkien and craft beer fans, here’s everything you could ever want to know about barley in Middle-earth. Barley was domesticated in the Middle East, in the region of the Fertile Crescent, at about the same time as wheat, about 10,000 years ago. Although barley is only rarely mentioned in J.R.R. Tolkien’s legendarium, we can safely assume that this economically important grain was widely cultivated in the Middle-earth of the Third Age, as it is today across temperate regions of the Northern Hemisphere because of its importance in brewing beer (see “Economic Uses”), as is clear from the reference to “1420 malt” in the preceding quote. One can easily imagine the conversation between Sam Gamgee and Ted Sandyman occurring over a few pints as they sat in a corner of The Green Dragon pub at Bywater discussing trouble on the borders of the Shire. And beer is frequently mentioned in The Lord of the Rings, as illustrated in the following few examples (listed in order of their occurrence). When Frodo and his three friends had dinner at the home of Farmer Maggot, there “was beer in plenty … beside much other solid farmhouse fare” (LotR 1: IV), and when they reached the Prancing Pony in Bree, Sam’s misgivings relating to his being outside the Shire were “much relieved by the excellence of the beer” (LotR 1: IX). When Merry and Pippin dine with Aragorn, Legolas, and Gimli at the ruined entrance to Isengard, Merry asked if they would like “wine or beer” (LotR 3: IX). When Gandalf and the four hobbits stopped again in Bree on their return journey, they attempted to explain that Strider was now the king; Butterbur imagined the king in his great castle, “drinking wine out of a golden cup” and was surprised when Sam disagreed, telling him that “he says your beer is always good” (LotR 4: VII). Finally, when they returned to the Shire, they found that the Bridge Inn had been torn down and were dismayed by the changes they found, especially the changes in how hobbits interact with each other—following petty rules and distrusting others instead of providing hospitality. Sam, in frustration, said “All right, all right! … I don’t want to hear no more. No welcome, no beer, no smoke, and a lot of rules and orc-talk instead” (LotR 4: VIII). Beer clearly is associated with hospitality, good conversation, and fellowship, reflecting Tolkien’s own enjoyment in sharing a few beers with his friends. Etymology: “Barley” is derived from the Old English bærlic, which was originally an adjective (“of barley”; with bere as the corresponding noun), from Proto-Germanic bariz (barley) + lic (like), and this probably derived from Proto-IndoEuropean bhars- (bristle, point), which also gave rise to the word “bristle.” Interestingly, the word “barn” is derived from Old English bereærn (barley-house), as it is a place for the storage of grain. The scientific name Hordeum, the classical name for this plant, is related to the Latin horrere (to bristle), which is derived from Proto-Indo-European ghers (to bristle), both of which are references to the elongate awns on the inflorescences of this important grain. Distribution and Ecology: Barley is native to western Asia and northeastern Africa, was domesticated in the Fertile Crescent region (in the area of Israel and Jordan) about 10,000 years ago, and was then spread widely as a cultivated grain. Wild populations have a disarticulating inflorescence (so disperse their own seeds), whereas in cultivated barley the grains are held on the plant (so they can be easily harvested and thus rely on humans for distribution). Cultivated plants also have wider leaves, shorter stems, shorter inflorescence awns (bristles), and larger grains. The small flowers are wind-pollinated (cultivated plants are largely selfing), and the grains of wild populations are dispersed by animals because their elongated awns (bristles) become entangled in fur or feathers. Barley is common in grasslands, open woodlands, or various disturbed habitats. It is quite tolerant of poor soils and saline conditions. Economic Uses: Barley is economically important because the beer-brewing industry is mainly based on barley malt, which is made by soaking barley grains in water, allowing them to germinate (enzymatically converting their starch to sugars), and then rapidly kiln-drying them. In beer making, the malt is fermented to convert the sugars to ethyl alcohol (and then flavored with hops). The resulting alcoholic fluid (beer) can then be distilled, resulting in whiskey. However, barley is also used in making flat bread, and in soups and stews. Description: Annual herbs, without rhizomes; stems erect, jointed, round in cross-section, hollow in internodal regions. Leaves alternate, two-ranked, simple and differentiated into a spreading blade, a sheath that closely encircles the stem, with its margins not fused, and with a membranaceous flap of tissue (the ligule) at the junction of the blade and sheath; the blade linear, flat, glabrous, but sometimes roughened. Inflorescences terminal, spikelike, with three spikelets per node, not breaking apart in cultivated plants, but falling apart (with spikelets falling in triplets) in wild populations. Flowers very tiny, arranged in spikelets, with only a single flower per spikelet; spikelets are arranged in two, four, or six rows along the axis, and each flower is surrounded by two bracts (a lemma and palea), some of these (the lemmas) often with elongated awns, with three sagittate anthers and two fused carpels; the ovary superior; the two stigmas plumose. Fruit a large plump grain, usually tightly enclosed by the bracts; nutritive tissue hard or mealy.